System-wide Text Lookups At Your Fingertips. Unlimited potential through easy to create plugin modules. Customizable lookup trigger to either a mouse button or key combination. Access to text in the system that may not be selectable or copyable. Quick access and dismissal. It is there when you need it but stays out of your way. 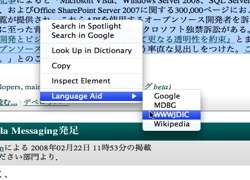 Language Aid requires Mac OS X 10.4 or higher and many plugins require an Internet connection. 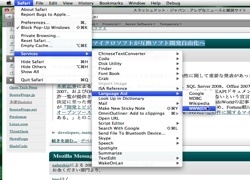 There are three ways that you can grab text from your system and pass it to Language Aid. You can hover your mouse cursor over most text in the system and hit the lookup trigger. You can select text and use the contextual menu plugin in supporting applications. You can also use the Language Aid system service on selected text. Language translations using Google Translate. 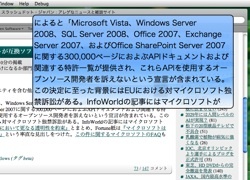 Japanese dictionary lookups using Jim Breen's WWWJDIC. Chinese dictionary lookups using the MDBG. Don't see anything there that is useful to you? Email us at [email protected] and tell us what web service or lookup method you want to see Language Aid interact with. We might just make a plugin for your favorite language or web service! You can also try your hand at developing your own plugin with the easy to use Language Aid SDK. Discounts and system image-able versions of Language Aid are available to institutions and organizations such as language labs and universities who wish to purchase large numbers of licenses. Interested parties can email [email protected].